Four horses pull a stagecoach into the town of Rainbow Ridge. Take your seat inside or atop your stagecoach. Get ready for a ride through the wilderness of Frontierland. The Rainbow Mountain Stagecoach Ride starts from this loading area. Your stagecoach shares a well-worn dirt path with the Conestoga Wagons. Four horses pull your stagecoach on a journey that takes you along the shore of the Rivers of America and into the Living Desert. This corner of the park looks like a natural wilderness. In the Living Desert, keep your eyes open for balancing rocks, bubbling pots of colorful mud, and saguaro cacti that look strangely human. A stagecoach travels along the Rivers of America. This corner of the park is remarkably large, and it’s easy to pretend that you really are traveling on a stagecoach through the wide open spaces of the Old West. 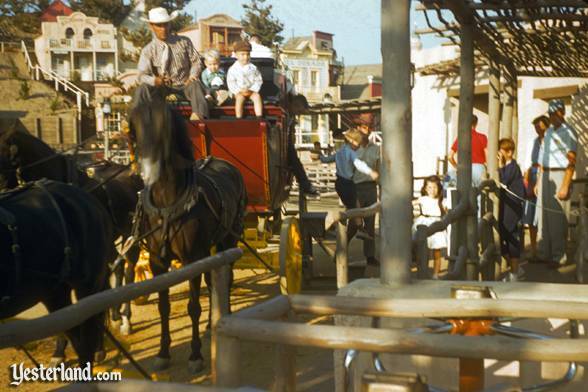 The Stagecoach Ride opened at Disneyland in 1955 as part of the original roster of Frontierland attractions. 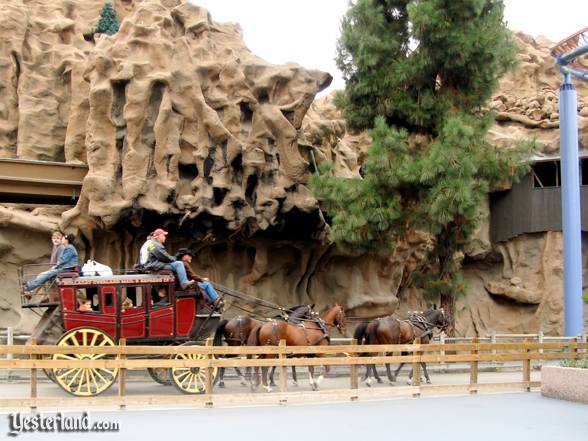 In 1956, with the addition of the Living Desert and other new scenery, the ride became the Rainbow Mountain Stagecoach Ride—although most Disneyland guidebooks and brochures from 1956 through 1959 continued to call it the Stagecoach Ride or just Stagecoaches. The Rainbow Mountain Stagecoach in the Living Desert. The ride closed forever in 1959 to make way for the construction of Nature‘s Wonderland—Beaver Valley, Bear River, and spectacular Cascade Peak. 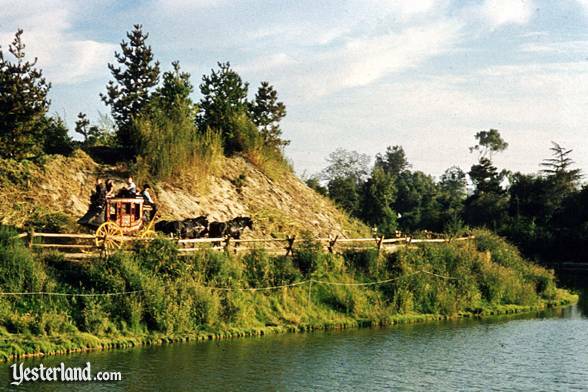 When Nature’s Wonderland opened in 1960, there would be only two ways to travel through it—the Mine Train through Nature’s Wonderland and the Pack Mules through Nature’s Wonderland. 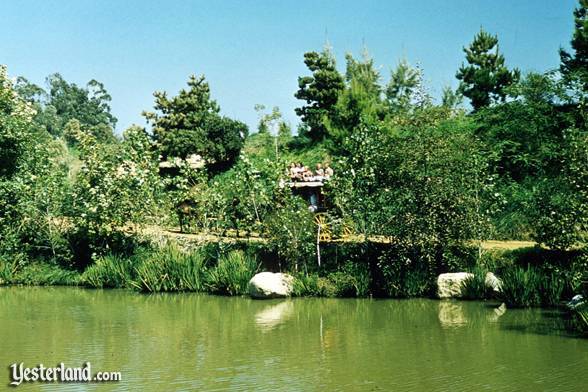 The Stagecoach Ride is one of Disneyland’s iconic “gone but not forgotten” attractions, like the Monsanto House of the Future. Disneyland Stage Lines Concord Coach on display in 2005. For Disneyland’s “Happiest Homecoming on Earth” 50th anniversary celebration, the park rolled one of the old stagecoaches into Big Thunder Ranch. It appears to be the same stagecoach that’s in the fourth picture on this page—the one with the caption, “A stagecoach travels along the Rivers of America.” For the celebration, it had a blue-and-gold 50th anniversary emblem above its door. A poster in the 1950s? Disneyland has a tradition of terrific attraction posters. The picture above is not from the 1950s. Your first clue is the Pirates of the Caribbean didn’t open until 1967. 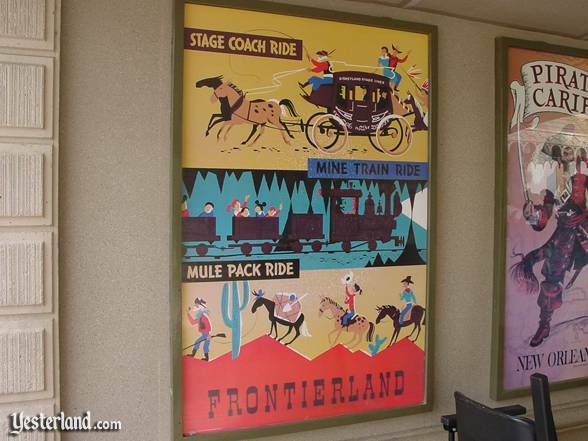 Actually, the picture above is from 2001, even though the attractions on the Frontierland poster were long-gone by then. It’s good that Disneyland acknowledges and celebrates its past, and that many guests recognize the excellent graphics of the early attraction posters. Even on slow days, it can be a long wait for this low-capacity attraction. The interior is quite cramped. But it’s fun to experience travel inside an actual stagecoach. Unfortunately, the view from the stagecoach consists largely of a forest of supporting columns and twisting steel track of the various thrill rides that have invaded what was once Knott’s Berry Farm’s tranquil core. Last updated April 25, 2008. Photo of four horses pulling a stagecoach in Rainbow Ridge: by Frank T. Taylor, courtesy of Chris Taylor. Photo of a stagecoach in the loading area: by Frank T. Taylor, courtesy of Chris Taylor. Photo of Stagecoach Ride and “natural wilderness”: by Charles R. Lympany, courtesy of Chris Taylor. 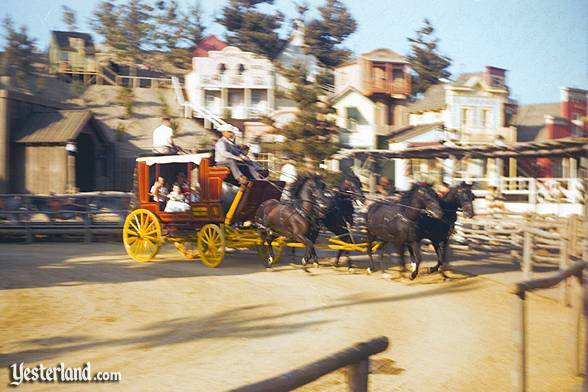 Photo of Stagecoach Ride along the Rivers of America: by Charles R. Lympany, courtesy of Chris Taylor. 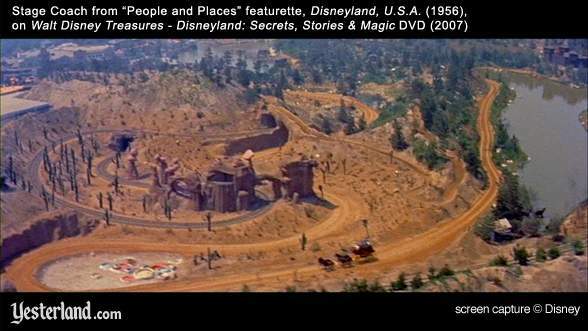 Screen capture from Disneyland, U.S.A.: © Disney. 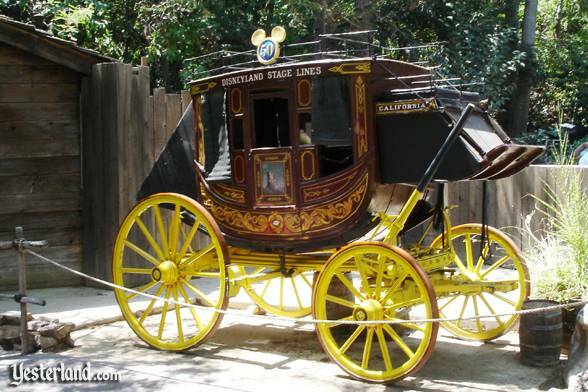 Photo of Stagecoach on display during 50th anniversary of Disneyland: 2005 by Allen Huffman. Photo of vintage Frontierland poster: 2001 by Allen Huffman. Photo of Butterfield Stagecoach at Knott’s Berry Farm: 2007 by Werner Weiss.